In a series of blog posts and eventually manuscripts, Matthew Katz, MD, and colleagues developed a hashtag ontology for cancer (Table 1) The Cancer Tag Ontology (CTO) covers disease states (eg, #mmsm) and the Oncology Tag Ontology (OTO) covers Clinical Tags (eg, #pallonc) and Scientific Disciplines (eg, #cactc). This system is dynamic in that additional hashtags can be proposed to be added here. Of note, For the Symplur hashtag registry, the hashtag must be more than 4 and less than 30 characters long. There is a Hashtag Finder app that can integrate with web browsers to help support using the appropriate hashtag and provide usage data. Typing in a word like “thrombosis” shows you what is found for hashtags and the frequency of use (Figure 1). Similar systems were later started in other disease states (Table 2). 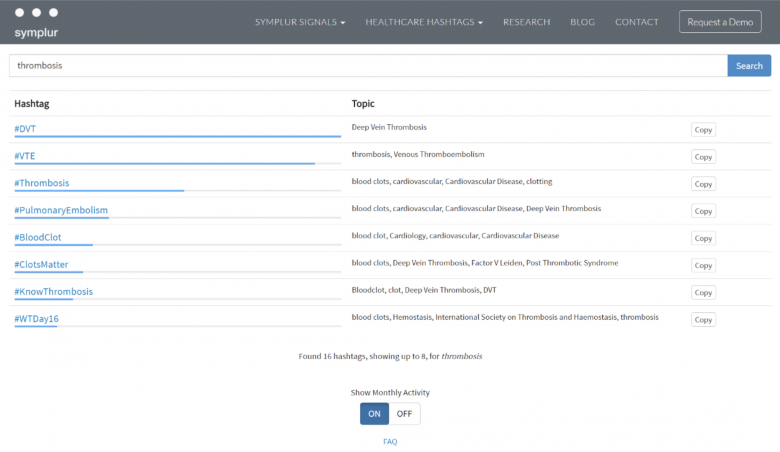 The Symplur “Healthcare Hashtag Project” allows for searching and seeing the organization of hashtags outside of hematology or oncology specifically. These ontologies have developed both as grass roots efforts (eg #bcsm. #btsm) as well as assigning hashtags that were then later used frequently (eg #mmsm) or rarely used (eg #intonc). The Hematology Tag Ontology (HTO, Table 3) is presented here to help organize social media content of interest to hematologists and with some overlap with the CTO and OTO as well as newly devised content. We will plan to address usage of the CTO / OTO / HTO and add and edit hashtags in the future as needed for new content or low usage. The HTO proposed uses hashtags currently in use (#leusm, #mmsm), makes choices between multiple used hashtags (eg, “thrombosis”) based on use frequency (using currently or was newly conceived to fill perceived gaps (eg #BMFSM). There is always a tension between lumping (#leusm = all leukemias) versus splitting leukemia into ALL, AML, CLL, CML, CMML, HCL, etc specific hashtags. We anticipate modifying based on feedback and actual use statistics in the future. Of course, all of these organizational structures are not binding, but rather a voluntary way to encourage character deiminated sharing to improve specificity in real time and in online searches. For instance, is #amyloidosis useful instead of a search without a hashtag in front, or should the currently used #amyloidosis be converted to something like #amsm or #amlsm or #ALsm, etc. We hope this helps anyone using social media including clinicians, researchers, patients, and caregivers. A non-comprehensive listing of hematology hashtags for annual meetings is also noted in Table 4. This may be added to in the future. One time promotional campaigns (eg, #WTDay16) were not included in the list. This is not one person’s view of how social media content in hematology should be organized. Rather, a number of people influenced the development of this ontology over time including the original OTO/CTO contributors, Navneet Majhail, MD (@BldCancerDoc), Naveen Pemmaraju, MD (@doctorpemm), Oana Paun, MD (@__oana), Krishna Komanduri, MD (@drkomanduri), and many others. This initial HTO now represents 31 hashtags (many are non-unique vs CTO/OTO) in 12 categories (Table 3). Just as the CTO / OTO and other lists have caught on, please try to add to, use and promote the HTO. Katz3 Health Tag Ontology Project: Adding Meaning to Social Media? MCSMN Blog A tag ontology is a structured system, more ‘top-down’ than ‘bottom-up’. See an always up to date list on the Hematology Tag Ontology page. Not meant to be comprehensive.